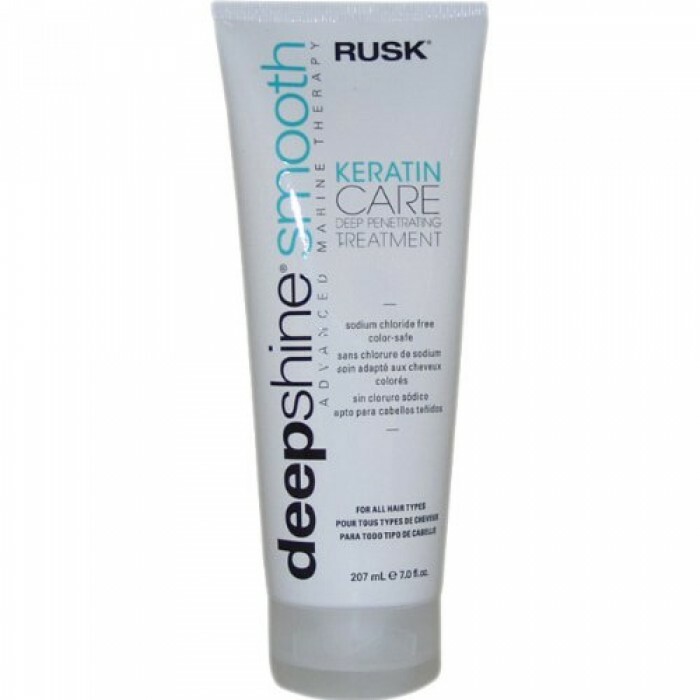 Rusk Keratin Care Smooth Treatment is a professional hair care line formulated with natural keratin to help replenish the hair’s natural keratin, which may be lost or damaged during the chemical/color process. 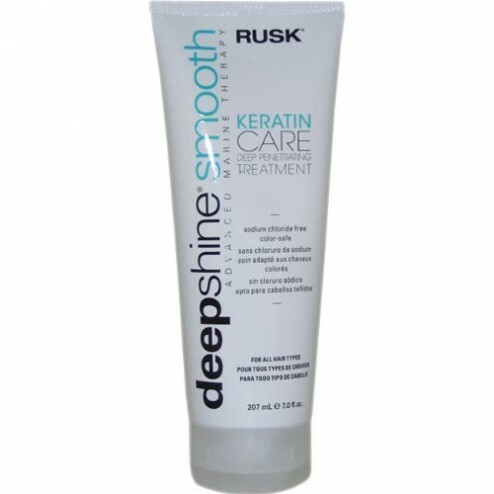 Rusk Keratin Care Smooth Treatment 7 Oz. Rusk Keratin Care Smooth Treatment strengthens and repairs the hair; restores elasticity; locks out humidity; and improves overall texture and condition, leaving it smooth and shiny. Sodium chloride-free, intensive treatment that delivers surface smoothing conditioning. Natural keratin helps moisturize and restore youthful shine to hair. Replenishes moisture levels and instantly nourishes dull, weak hair. Restores hair’s elasticity, strength and vibrancy. For all hair types, including anyone with chemically or color treated hair. Apply to clean, wet hair. Massage in thoroughly. Leave in for 3-5 minutes. Rinse thoroughly. Water (Aqua, Eau), Cetyl Alcohol, Cetearyl Alcohol, Stearyl Alcohol, Cyclopentasiloxane, Dimethicone, Behentrimonium Methosulfate, Glycerin, Chlorella Pyrenoidosa Extract, Chondrus Crispus (Carageenan) Extract, Laminaria Saccharina Extract, Undaria Pinnatifida (Wakame) Extract, Fragrance (Parfum), Propylene Glycol, Quaternium-91, Cetrimonium Methosulfate, Panthenol, Hydrolyzed Wheat Protein, Keratin, Hydrolyzed Keratin, Wheat Amino Acids, Hydrolyzed Oat Protein, Butyrospermum Parkii (Shea Butter), Vitis Vinifera (Grape) Seed Oil, Simmondsia Chinensis (Jojoba) Seed Oil, Macadamia Ternifolia Seed Oil, Honey (Mel, Miel), DMDM Hydantoin, Iodopropynyl Butylcarbamate, Hydroxyisohexyl 3-Cyclohexene Carboxaldehyde, Linalool, Butyphenyl Methylpropional, Hexyl Cinnamal, Citronellol.